Another day in Singapore and another thunderstorm, but fortunately, another university designed in such a way that movement between buildings can be undertaken easily and in the dry. My meeting was scheduled to commence in the newly refurbished Librarian’s Offices. The Librarian’s Offices have recently been refurbished and include a new multi media boardroom and Library Training Room. The board room has dual projection and smartboard facilities. Laptops can be connected to the systems via input plates located in the table, but in order to ensure that the table top is left clear, the input plates are located at various points underneath the table top. Up to 4 laptops can be connected into the data projection system and switched via a touch screen panel. The room also has video conference capabilities. The recently upgraded Library training room has been upgraded with 30 fixed PCs for library training and other workshops. The layout has been changed from straight to curved rows. The side walls are glass to provide additional writing surfaces. The University is relatively young, and subject disciplines are growing rapidly, as is the demand for space for collections and reading places. New spaces to accommodate group and collaborative learning are also being demanded by students. This has created a challenge for the Library to create a balance between the demands for the physical collection (not everything is available as “E”) and student study spaces. 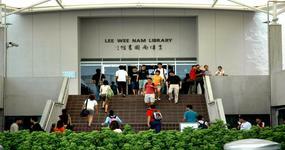 The Library is a 5 story building, with many of the study facilities located around the perimeter of the building. The Library reviews spaces within the 7 university libraries regularly to identify opportunities to repurpose spaces to create added value. As a result of the heavier component of group based work in the university, they quickly identified that the University did not have any well equipped discussion spaces for the students to use after classes ended. A survey identified that students studied at the University first (classes), home next and last choice was to go to the library, and this was often because the students had a problem they needed assistance with. Using the “Cool Campus Budget”, the Library identified a small (300 square metres) space to create an experimental Learning Commons. The space was transformed to provide: Learning Pods, Multi-media PCs, a recording room, video wall and digital newspapers. 6 Learning Pods have been created, 3 of which are located close to the IT Help Desk. The tables here are reconfigurable for the students to create layouts to suit their needs. All of the Learning Pods have blue glass writing panels which are also magnetic and conventional whiteboards. When booked, the students check in at the Help Desk and are issued with a pack which includes writing pens and equipment use instructions. The multi-monitors provide a bigger screen surface and the option to open up more applications all at one go. The PC workstations are equipped with ‘Pinnacle’ software for video editing. 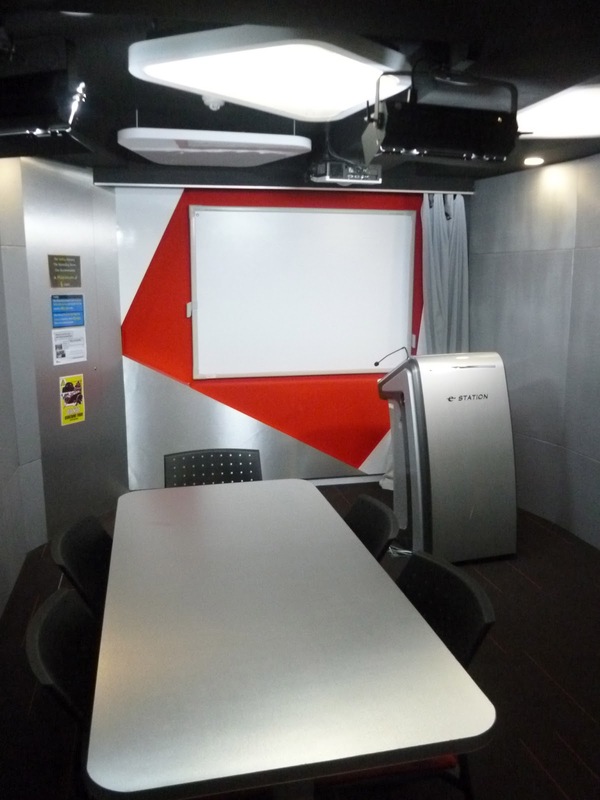 This is a small room providing students with access to audio and video recording facilities quickly and conveniently. The Recording room is fully equipped with recording equipment, a green screen and chroma key software. 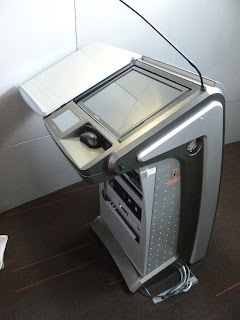 There is a fully equipped "e-lectern" for student use. Displays include information about the digital resources and facilities provided by the library. There are 8 sound domes suspended from the ceiling to project sound from the video wall, minimizing sound spillage into other areas. The area has intentionally not been enclosed because it is used by Student Societies and other groups for various events. This is a nice free open space that attracts a lot of attention when events are being held. There are 3 digital newspaper readers at the Commons. The LCD screens are interactive, allowing users to flip pages and browse digital editions of newspapers. Topical, a page from the Straits Times! The Learning Commons has been open for approximately one year, and the Library has undertaken an evaluation of the impact of the space on students, their learning and their use of the Library. The results show overwhelmingly that the Learning Commons, although small, has had a huge impact upon student behaviour, and as a result the Library is now seen as the first destination for study facilities. In view of this success, and, taking into account the student feedback, the Library has created a second, and larger, Learning Commons in the Business School Library. The Business Library Learning Commons. The Business Library Learning Commons is a much larger facility and includes other services seen to provide added value to the students. The design of the space is meant to mirror that of a railway carriage. Immediately inside the entrance can be found the Business Lounge. This is a small space set up in an informal manner for students to access Bloomberg resources that are not freely available on the internet. Students are able to come here and work and/or met with others over a drink as tea and coffee facilities are available to them. The Learning commons is located on the lower ground floor and houses a large number of open access PCs for general use, with both single and dual screens. Next to the study pods is the Cinema room, used by students to both create and view their presentations and videos. This is quite a “cool” room with some nice features. Here students can search databases for jobs on dedicated PCs. Appointments with advisors can be made and informal discussions held in the small open meeting area alongside, or students can simply use the space and resources to prepare for interviews. Again, there are many more interesting things to talk about here at NTU, but space and time don't allow! Just wanted to let you know how much I've enjoyed this series. Very useful in rethinking learning spaces. No, thank you, I am really pleased that you have enjoyed it!! Clearly it has been an amazing and unique honour to do this and I hope that it has made sense to the reader, as there is so much more that I have not been able to convey, simply due to time constraints! I am now home and need to write up the full report within the month, so the hard works starts now! !